A small, individual-size cake that's usually baked in a muffin pan. Sometimes the cupcake mold is lined with a crimped paper or foil cup. After baking, the paper or foil is simply peeled off before the cupcake is eaten. When baking cupcakes, place pan in the middle of a preheated oven. Let the cupcakes cool completely before you decorate them. Make your cupcakes into a caterpillar by icing the bottom and sides of each one, then line them up in a wiggly row with the un-iced sides down. Decorate the front cupcake with lollipop antennas, candy eyes and nose and a shoestring licorice mouth. To all the other cupcakes, add shoestring licorice feet and other decorations. For a fuzzy caterpillar, sprinkle on some coconut. Are You Eating Muffins or Cupcakes? Hot breads are always a hit and muffins are one of the easiest to make. They are more quickly and easily made than biscuits and no kneading, rolling or cutting is required. They can be a savory, last minute dinner muffin or a sweet delicious breakfast muffin. Made using whole-wheat flour, wheat germ, bran, honey, fruits and nuts they can be very nutritious. But like the healthy granola craze which turned into candy bars, muffins also can quickly turn into cupcakes. Eating cupcakes for breakfast is your choice, but don't tell yourself you are eating healthy breakfast muffins. 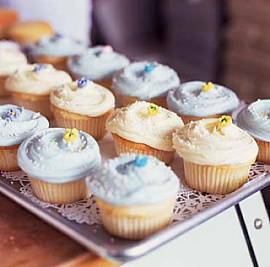 A recent magazine article revealed some muffins available in New York delicatessens were claimed to be low fat, but actually contained up to 23 grams of fat. That's more fat than two Egg McMuffins. What is the Difference Between Muffins and Cupcakes? Some say cupcakes have frosting. A basic formula for muffins is 2 cups flour, 2-4 tablespoons sugar, 2 1/2 teaspoons baking powder, 1/2 teaspoon salt, 1 egg, 1/4 cup oil, shortening or butter, 1 cup milk. When the fat, sugar and egg ratio in a recipe reaches double or more than this, you have reached the cake level. The method of cooking is different for muffins and cupcakes. The muffin method is by far the fastest and easiest. Flour, sugar, baking powder and salt (all the dry ingredients) are mixed together. This is where the leavening can be uniformly dispersed into the flour. Sugar is mixed with the flour to prevent the flour from lumping when combined with the wet ingredients.